Koutroulou Magoula. Nina Kyparissi-Apostolika (Director Emerita, EPSNE) and Yannis Hamilakis (Southampton) report on the first year of a second five-year programme of collaborative work at this Middle Neolithic site in Thessaly with the aims of refining our understanding of intra-site organisation, including indoor and outdoor spaces, and of the extent and nature of human involvement from the Neolithic to the present. Additional goals are the examination of people, plant and animal interaction, and of the production, circulation and consumption of all types of material culture, including the site’s unique assemblage of figurines. The project continues to explore the site’s role in local perceptions of antiquities and to develop community and public archaeology activities. Limited excavation in 2015 exposed 38 m2 in two trenches, an area extremely rich in finds both portable and architectural, producing over 22,000 sherds and more than 60 figurines and five house models (Fig. 1). Excavation in this area has thus shown the existence of further substantial buildings north of those previously revealed, and reaffirmed the role and importance of unroofed spaces between houses as key activity areas and spaces of socialisation for the community. In addition to excavation, a drone was used to record the topography of the tell as a whole and photogrammetric representations of architectural features were carried out, including the previously excavated LBA tholos tomb (Fig. 2). Soil micro-morphological analysis has produced significant results, the most important of which is that a significant part of the deposit in the magoula, including inside the stone built buildings, is very rich in animal dung. This shows that animals were kept in the settlement for at least parts of the year, probably sharing spaces with humans. Combined archaeobotanical, zooarchaeological, phytolithic and soil-micro-morphological analyses show that sheep, goats and cattle were maintained using diverse animal foddering practices (some on-site and some off-site) exploiting different ecological zones. 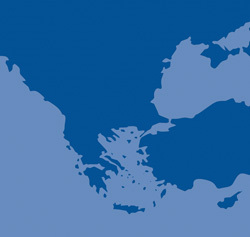 Finally, although the site’s ceramics place it squarely within the Middle Neolithic, AMS dating situates a relatively short-lived Neolithic presence there between the end of the 7th and the first two centuries of the 6th millennia, conventionally the transitional period between Early and Middle Neolithic in mainland Greece. The site thus contributes to a rethinking of Neolithic chronology in Greece, while the short lived character of the Neolithic occupation contrasts with the evidence for extensive rebuilding and destruction. Unpublished field report, British School at Athens. Fig. 1/ Koutroulou Magoula, plan of excavated area, showing 2015 trenches Z2 and Z1 extension (V. Tsamis). Fig. 2/ Koutroulou Magoula, photogrammetric representation of LBA tholos tomb.